Competition with peer firms, alternatives to law firms, emphasis on diversity, and more, are forcing legal marketers to evolve their thinking and take a leadership role to drive effective outcomes. The recent LMA West Region Continuing Marketing Education conference “Nexus of Change” focused on three fundamental areas: a macro view of the changing industry; how changes are impacting legal marketers; and managing ourselves as individuals so we can adapt to these changes. 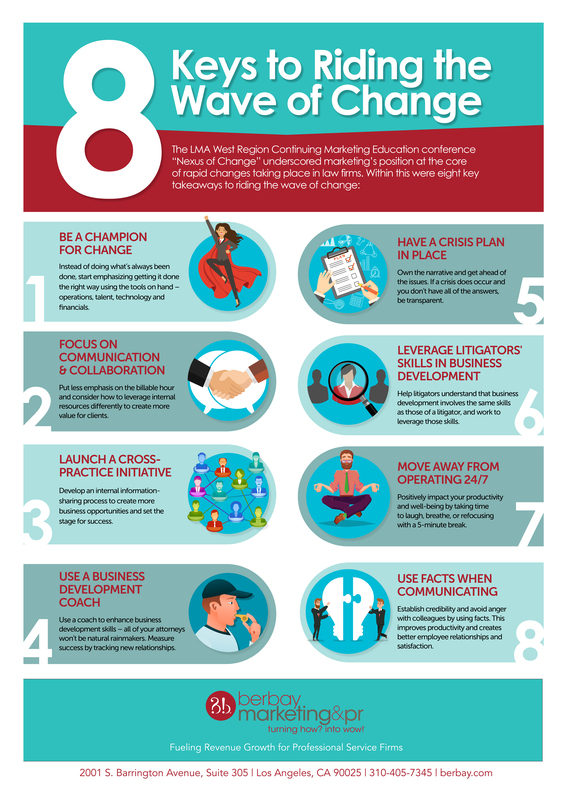 Within this were eight key takeaways to riding the wave of change. Read the LMA West CME Recap. Watch the LMA West CME Recap.